A 4-year-old Honduran girl carries a doll while walking with her immigrant mother. Both were released Sunday from federal detention in McAllen, Texas. Rachel Osborn knows kids who slept in the immigrant detention centers in Texas that have dominated recent headlines. "We have kids who will say that was the worst part of their journey," Osborn says. "They were traveling for weeks and the hardest part was being in this freezing cold room where, you know, they were fed a cold sandwich and had a thin blanket to shiver under." And they had no parent or caregiver to comfort them and make them feel safe. Osborn is a therapist at Mary's Center in Washington, D.C., who works in schools with children who immigrated from Latin America to the U.S. without their parents. The kids she works with weren't forcefully taken from their parents by U.S. immigration agents, but the trauma, Osborn says, is similar. Thousands of kids were taken from their parents by immigration officials and placed in detention facilities under the Trump administration policy that was in place from April until it was changed Wednesday. 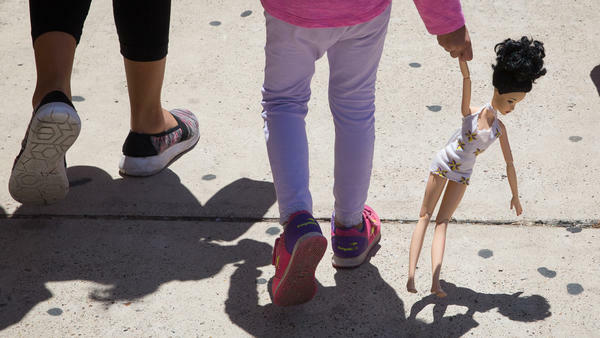 Researchers suggest these children, and others who have spent time in those detention facilities, may have increased long-term health care needs. That's because the stress of being separated from a parent can also cause lasting physical harm to children. These harms can include reduced immune system functioning in the short term, and increased risk of heart disease, diabetes or other chronic health problems in the long term. Kids, like everyone, have a physical response to stress. The heart rate speeds up and the body releases hormones like cortisol. But when they don't have a parent or adult that they trust to comfort them, a prolonged stress response can become toxic and cause physical damage. "The most powerful stress buffer known to humans is the presence and availability of the parents for young children," says Megan Gunnar, a professor at the Center for Neurobehavioral Development at the University of Minnesota Medical School. It's impossible to know which of the detained kids may see damage to their health or how severe that damage may be. But the conditions are there, according to Nithya Nathan-Pineau, who works for the detained children's program at the Capital Area Immigrants Rights Coalition, in Washington, D.C. Her organization advocates for the rights of immigrants and has direct contact with some children who were separated from their parents under the Trump administration policy. "We talk to these kids directly. What we're seeing is that they are extraordinarily traumatized," she says. She describes a meeting with a 10-year-old child in a government detention center. "Essentially during the first intake [the child] couldn't really report anything to us because the child was so distraught they just cried through the whole intake," she says. When she went back later, she found out what was going on. "We learned that at this point they had been in the area for over four weeks and the child has not been able to speak with their parent," she says. "They don't know where their parent is." Without a parent's comfort, a child's stress response can go into overdrive, explains Dr. Nadine Burke Harris, CEO of the Center for Youth Wellness in San Francisco. The center includes a clinic that treats kids who have gone through trauma, and it also conducts research on the effects of trauma on children and ways to counter them. Burke Harris says when children are comforted by their parents, they produce more of the hormone oxytocin, which helps relieve the stress response. "People call it the cuddle hormone," she says. "It helps to shut off the stress response when it's activated. But it also helps to protect our organs from damage when the stress response is activated." And that leads to many different health problems, she says, including "changes in brain development, changes in the hormonal systems, immune system, cardiovascular system, and even the way our DNA is read and transcribed." Gunnar says her research suggests removing children from their parents' care can make them more vulnerable to infections. She says evidence first showed up in monkeys that were taken away from their mothers for as little as two weeks. Years later, those monkeys showed a weaker immune system than the ones who stayed with their mothers. Gunnar says she is now seeing a similar response in teenagers. "If you were an old person it would be called immune senescence," Gunnar says. "Your immune system getting beyond the point where it can function." Essentially, she says, the body's immune system wears out early. Gunnar says she's not sure whether these signs mean there is long-term harm in humans. "We don't know if we see them in teenagers, whether it means that their cells are not going to be able to fight as long," she says. "But we do know if we see this in the aged, that is a sign that the immune system is coming to a point where it's not going to be able to fight things off." President Trump now says his administration is going to end its policy of separating families that come into the United States illegally. But the policy may have already done some long-term damage. Experts say the mere act of taking a child from a loving parent or caregiver can have negative consequences. I was talking to NPR's health policy correspondent Alison Kodjak about this. She says that these separations can even affect the physical health of children. ALISON KODJAK, BYLINE: So there's a lot of research out there that shows that trauma in childhood can have physical health impacts. Stress in kids, just like stress in adults, can cause damage. And one thing that can protect a child from the physical impacts of trauma is the presence of a parent. So I talked with Dr. Nadine Burke Harris. She runs the Center for Youth Wellness in San Francisco. It's a center that treats and does research on kids who have gone through trauma. And here's what she told me. NADINE BURKE HARRIS: Listen. We all go through stress. But our bodies have, actually, these amazing systems to help heal and recover. For example, I think many of us are familiar with the hormone oxytocin. People call it the cuddle hormone. So it helps to shut off the stress response when it's activated. But it also helps to protect our organs from damage when the stress response is activated. KODJAK: She says when kids are with loving parents or caregivers, that buffer kicks in and can protect their little bodies from the impacts of stress. GREENE: OK. So being near a parent or someone who is showing you love can protect you against stress. What happens when kids don't have that person near them? KODJAK: ...Your body starts shaking. But we can get our bodies under control. When you can't get it back under control, it becomes what doctors call a toxic stress response. And here's how she describes it. BURKE HARRIS: If kids are exposed to high doses of adversity without the presence of a nurturing buffering caregiver, the stress response becomes overactive. And so it leads to lots and lots of different health problems - changes in brain development; changes in the hormonal system, immune system, cardiovascular system and even the way our DNA is read and transcribed. GREENE: So Alison, this sounds like long-term stuff. I mean, this could be the kinds of things that kids could feel over a long period of time. KODJAK: Yeah, they clearly could turn up later. We obviously don't know how it's going to play out with any particular child. Everybody responds to trauma differently. But the researchers I've spoken to say that these long-term impacts, this toxic stress response, can wear on your organs over years. These kids could find that they have heart disease or other health problems at an earlier age than they might otherwise have had. GREENE: OK. So these are things that could turn up much later. We might not see these kids showing symptoms of physical problems now. KODJAK: Not necessarily. But there's other research that suggests there could also be shorter-term impacts. Kids who have experienced trauma can have higher rates of things like asthma or immune disorders or even trouble fighting infections. GREENE: So it's sounding like the bottom line, Alison - I mean, if kids experience this kind of stress - trauma can be especially bad for people who are younger. But all of this gets worse if you don't have a parent there with you. KODJAK: Exactly. I mean, all of these kids have already gone through some trauma. They've been taken away from their homes. They've gone on this long journey to get to the United States border. And then just taking them away from their parent makes it that much worse. GREENE: All right. NPR health policy correspondent Alison Kodjak, thanks a lot. KODJAK: Thanks, David. Transcript provided by NPR, Copyright NPR.